"WELCOME ABOARD!" My name is Captain Andy Sitarski and I would like to personally welcome you and also say thank you for visiting the Fin Chaser Charter Fishing web site. I have been fishing for salmon and trout on Lake Michigan for over 20 yrs. I am available 7 days a week in order to give you the best catch possible on a daily basis. Whether you are an avid angler or novice fisherman, you will have a great time as our #1 priority is having fun and exceeding your expectations. We pride ourselves on customer satisfaction!! Our Customers return year after year because we do things the right way! So if you are looking for a great time with lots of memorable moments in a safe for all ages, comfortable, fun filled, relaxed atmosphere, you have come to the right place!! In April, May, and June, greater numbers of fish are caught for 2 reasons. The first being that we are fishing closer to shore which means less travel time and more fishing time. The second reason is that we are fishing with more rods in the water because we are targeting the water closer to the surface rather than deeper water during the later months. You can also expect to catch mostly Coho Salmon which to me, are the best eating that Lake Michigan has to offer, but there are King Salmon, Brown Trout, and Rainbow Trout (also known as Steelhead) that can be caught too. In July, August, and September on Lake Michigan, the Fin Chaser will bring the bigger King Salmon also known as Chinook salmon and the feisty Rainbow trout (Steelhead). 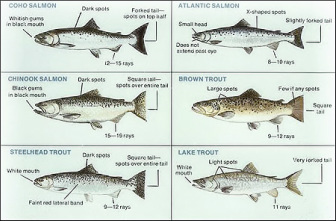 These salmon and trout are the real fighters and bring lots of excitement to the true charter boat angler. A good sized brown trout can also be taken in these months. In October we are fishing mostly for Lake Trout. Lake Trout, of all the Lake Michigan sport fish that charter boats troll for, are the only fish natural to Lake Michigan. These Lake Trout are always of good size and mostly found on the reefs. So come fish with us for King Salmon, Coho Salmon, Lake Trout, Brown Trout, and Steelhead (Rainbow trout) and enjoy an experience of a lifetime on beautiful Lake Michigan located in Port Washington, Wisconsin.! All ages are welcome... particularly youngsters, experience is not needed as we are fully prepared to assist you if needed.